I’m going to lay all this out – and it’s not going to be pretty. There is an active, coordinated effort to destroy Bitcoin and everything it was ever meant to be, and I will provide the argument. Bitcoin development was progressing absolutely fine prior to the take-over by Blockstream. Many businesses were being engaged, and the user base was growing exponentially. But the growth in transaction rates have slowed right down, and businesses have stopped using Bitcoin. These are two undeniable facts, and are publicly verifiable. When a large percentage of Bitcoin Core developers are on the pay role of a single entity like Blockstream, then we have a huge, incentivised agenda to skew the roadmap. The evolutionary response to a vice-like restrictive, governance grip on what is supposed to be an open-source community developed platform is a break-away into a multi-dev environment. The Bitcoin Cash fork was a point of culminating pressure which Blockstream has imposed by restricting Bitcoin transaction capacity. 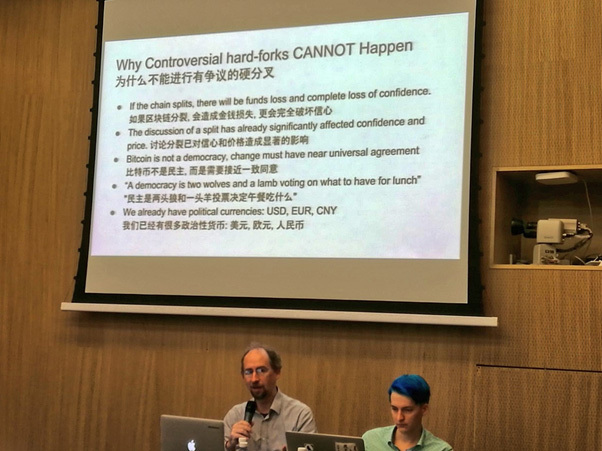 Of course, the hard fork itself, was something that Adam Back and company, tried very hard to prevent. But the hard fork did happen. Contrary to Adam Back’s bullet-point defiant presentation, the split chain did not cause a loss of funds, nor a loss of confidence. In fact, confidence increased as investors saw an end to one major aspect of in-fighting. It is no secret that Blockstream, and Core engage in heavy censorship tactics. The faceless shills of the Blockstream Core party flood various forums and social media, particularly twitter, with distracting posts, changing goal posts, and by using excessive numbers, actually manage to sway public opinion to some degree. Identifying these paid trolls is usually not difficult at all. Usually, a brief search on most of their history will expose these shills for what they are. They are the prostitutes of the Blockstream party, whoring themselves out to satisfy the demands of a centrally governed entity. 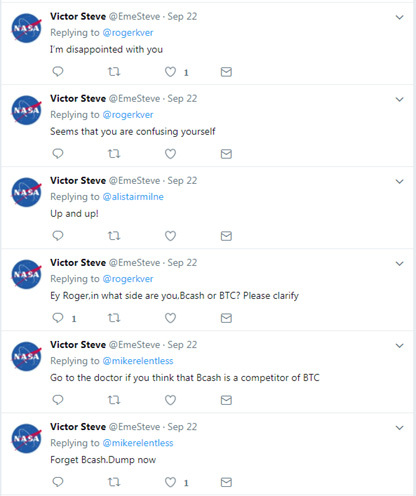 The user @EmeSteve rants and attacks Roger Ver and others repeatedly, and attempts to distort Bitcoin Cash public perception… what’s the agenda here? Like anyone researching anyone else, we hunt through the history… and what do you find? The early posts as seen above, were all entirely, 100% ads. These are ‘paid’ ads. This account is a ‘paid’ puppet account that does the bidding of the financier. There are literally hundreds of such examples across twitter and forums. Some a better concealed than others. But scratch the surface and the undeniable fact that Blockstream/Core engage in whoring out paid trolls is exposed. These trolls and shills are just one strategy in a multifaceted attack on Bitcoin. But they prey on the less-informed with devastating effect. Most trolls have nothing intellectually relevant to say, but where they succeed is in drowning out legitimate discussion, and diluting important topics with gutter-speak, and skewing public perception of popular opinion. It is through such tactics and more, that the original Bitcoin scaling proposals such as BitcoinXT and Bitcoin Classic were dismounted. Dare I say it, it is how Bitcoin Unlimited got dethroned also – from forces above Blockstream even. The strategies and techniques involved in these attacks come from an abundantly well funded source. It is not cheap to engage in DDOS (Distributed Denial of Service) attacks that can disconnect entire regions. Nor is it cheap to hire an army of faceless trolls to engage in social manipulation, in an eternal contract. The elaborate state of these attacks generally come well from funded state level operations. When Bitcoin as a peer-to-peer (P2P) currency becomes a direct threat to global payment processors, it means war. And a war has been happening since the birth of Blockstream in 2013. Truth doesn’t need censorship. Nor does truth require shills or trolls. 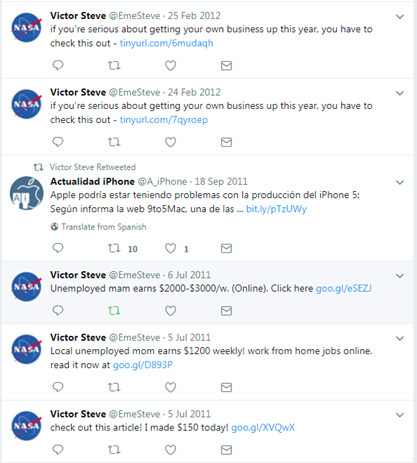 Each time you see a troll or a shill arguing one way, I challenge you to look the other way and discover the very thing they don’t want you to discover… When they try to discredit Roger Ver on twitter, it means Roger is on the right track. When they scream “known fraud” at Dr. Craig Wright, you can bet your bottom dollar that Wright has just made a very valid comment. When major payment processors started funding the development of Segwit, we could only scratch our heads. Why would these global corporations invest in a competitor… that is unless you’re investing in its derailment… Yes the duplicity is real. Segwit with a capped transaction limit is a radical change to Bitcoin’s fundamental nature. Extreme changes require extreme proofs of viability. And not just viability, but great improvements also. Where is the transparent, open research conducted to show exactly how Segwit will improve Bitcoin longterm? Even with blocks being full of Segwit transactions, capacity will only increase to 150-170%. That is simply not good enough by any measure. The transaction capacity comes at a cost of a much bigger blocks also (due to witness data). So the actual return on investment is actually less than what it may have been with an equal size block of that capacity. Much of that PR relied on the delivery of Lightning Networks (LN). How will Lightning Networks operate holistically? How will it scale in the face of on-chain settlement with volatile fees and a restricted blocksize? What happens if you can’t close a channel in-time due to excessive chain usage? Then there are some serious concerns that Lightning Network will make Bitcoin far more centralized than anything on-chain would. At the scaling Bitcoin Conference, the question was asked concerning the ETA for Lightning network. The short answer – 18 months, uttered only lightly. The technology is clearly far from ready, and as many analysts have stated, even if it were ready, it would not work to global capacity with a restrictive blocksize. If 1MB is not enough, then 2MB won’t be either. Either we open it up, or we intentionally destroy it. Despite Core developers constantly pushing LN as the scalability solution, it’s glaringly obvious Lightning Network comes with its own scalability issues. Lightning Network was never supposed to be a replacement for Bitcoin transactions. It can by all means support it, and users should be able to open their own private channels. But to ‘force’ users onto it is an abomination. Bitcoin can already do, near-instant payments through SPV wallets… well at least Bitcoin Cash can after the removal of the cap and the RBF (replace-by-fee). Zero confirmation payments are absolutely possible! Recently nChain’s Jimmy Nguyen presented some interesting research, demonstrating Bitcoin’s currently dormant smart contracts capabilities. It is very apparent, that Bitcoin’s designer left open the possibility to use the Bitcoin blockchain as a Turing tape in a Turing machine. Effectively being able to program all sorts of applications. One of the examples presented was that of a voting system, where each individual is assigned a public key. Imagine this scenario, where an entire population signs a transaction, on a capped 1MB, or even 2MB max blocksize… Suppose the cut off time to vote is midnight tonight, and you have a population wanting to sign. That is a catastrophe waiting to happen, because the congestion will simply not allow it, and it will bring the entire system to a halt. When Blockstream Chief Technology Officer Gregory Maxwell says that full blocks “is the natural state of the system”, he’s telling a whopper. Unless you are the designer, you cannot state something like that. And the designer clearly stated the opposite in saying that the 1MB cap was temporary and should be increased. Maxwell’s work with Confidential Transaction and HD wallets is to be praised. But his damage to Bitcoin can’t be over-stated. Following the split between Bitcoin and Bitcoin Cash, the move should have actually resulted in a toning down of attacks. But it did not. Intentionally calling Bitcoin Cash an alt-coin despite being a genesis Bitcoin sharing the genesis block, and censoring any speech calling it by its proper name is just the start of it. So how do we know who’s right and who’s wrong as far as Bitcoin and Bitcoin Cash go? There’s a simple answer here – but the trick is to always look ahead. Do the math, and look ahead, see where the technology, and economics lead. Today, we know that Bitcoin Core works on a high fee, capped transaction policy. This isn’t going to change in the near future. Now let’s fast forward to the ultimate saturation point of investment… Suppose Core are so successful, that everyone is invested in Bitcoin… Suppose for a minute, that euphoria is reach… Now every transaction would cost hundreds of dollars at the least. If everyone is invested, and there is no more money to be coming in, then there is no point holding anymore, after all, it is counter-intuitive to transact with, given the hefty fees. The only reason anyone is holding capped Segwit coins today is because they are expecting the value to rise. These are profit seeking investors, and these investors will sell and cash-in at the earliest signs of market saturation. Now re-play the same scenario with Bitcoin Cash (Bitcoin’s original roadmap). The entire world is invested in Bitcoin Cash, and the entire world can transact securely, and freely with minimal fees… Merchants transact and use it daily, knowing it is safe to use, does not cost you much, is mathematically governed, and will not lose value over time. The difference here is that Bitcoin Cash maintains a strong use-case upwards and onwards. Its utility remains very much alive and usable, even after market saturation. On the other hand, Bitcoin (BTC), has effectively become a pyramid scheme. It’s only use case is literally store of value. And when everyone has their money in it, the only thing left to do is take it out.